Review: A Cub Take on "The Lion King" | Theater | Style Weekly - Richmond, VA local news, arts, and events. 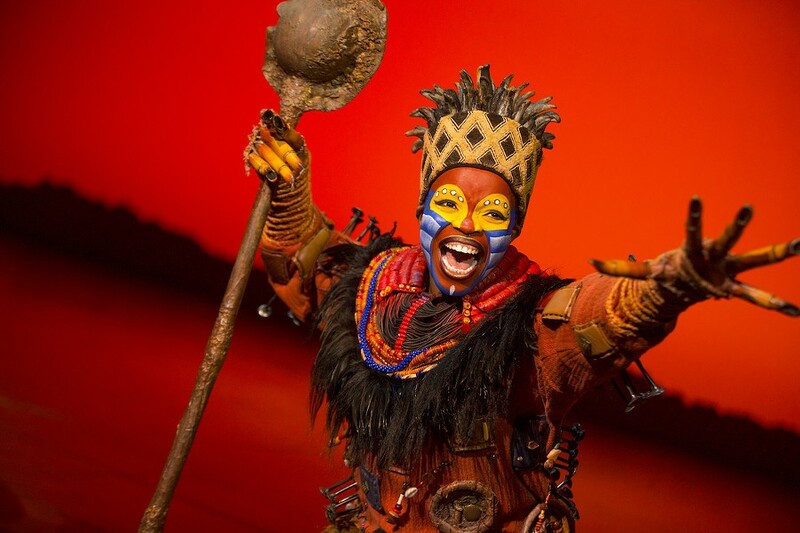 Mukelisiwe Goba as the lovable Rafiki in this year's adaptation of "The Lion King" musical at Altria Theater through Sunday, May 8. I get it: The theatrical adaptation of "The Lion King" is an amazing conglomeration of dazzling technical stagecraft. The current Broadway in Richmond production starts out with a beautiful parade of ingeniously constructed animals, instantly sweeping up the audience in Disney's -- or more specifically, director Julie Taymor's -- magical thrall. With its familiar music and endearing comic sidekick characters, it's a hard show to resist. That is, unless you've seen it several times before and have grown less enthrallable. I've written about "The Lion King" before and my opinions have become entrenched. It's a show where the overwhelming artistry of the staging is undercut by clunky plotting and underwhelming drama. Knowing that these are my biases, I have turned to my 12-year-old son, Mason, to provide an un-jaded perspective of the entertainment juggernaut that will tangle traffic around the Altria Theatre through May 8. David Timberline: You've never seen the stage version of "The Lion King" before. What were you expecting? Mason Timberline: I knew you had some opinions and that not all of them were good. So I wasn't expecting the show to be really good, but it was. When the animals first came out, it was crazy. All of the costumes were really creative and colorful, and then also there was music and dancing and it was all really cool. I really liked the relationships between some of the characters, like Scar (Patrick R. Brown) and Zazu (Drew Hirshfield). It was funny how they interacted. I also liked young Nala (either Savanna Fleisher or Imani Pullum); she was spunky but not too bratty. They chose the Mufasa (Gerald Ramsey) really well. He was great for that part, very regal and strong with a strong voice but wise also. Were there any parts that you didn't like? There were some parts where I couldn't hear what the actors were saying, and there were a few songs where the music was louder than the singers. It was also really long, like almost three hours. How did it compare to the movie? I thought it was more colorful and more creative. The costumes were just really cool. Also, on stage, Scar wasn't as mean. During some parts he was a pretty evil-mean but mostly he was a kind of funny-mean, more funny than he was in the movie. How did it compare to other musicals you've seen? It's a lot different because it's about animals not humans, so characters don't have the same kinds of interactions. They aren't saying, like, "Hey, let's go down to the bar." But it was still as good or better than other things I've seen. Would you recommend that others go see "The Lion King?" It has some good lessons about how you should be brave and don't run away from your past but learn from it. I think kids my age or younger will really like it. It would be more kid-friendly if it were shorter. "The Lion King" runs at the Altria Theatre through May 8th. Tickets and info at broadwayinrichmond.com.